As a tribute to the launch of this iconic vessel, 80 years ago, I posted some pictures there, and John Beugels replied already with interesting information about the French export version. Creation of this thread will possibly concentrate otherwise scattered information and views regarding this model. Now I have a new case. Except for well-known variations as boxes, numbers, text cast underneath, and with or without rollers, I know of no other differences in the casting of this model. Soon after I took my two models of the Queen Mary out of my displays, however, I discovered that my examples show a difference at the stern, i.c. the early '534/Queen Mary' shows a ridge there, representing the railing, whereas this seems to have vanished on my later 'Queen Mary' version. Now I wonder if this is an incident, perhaps caused by finishing the model under different conditions, or is this perhaps really a structural casting adaption? 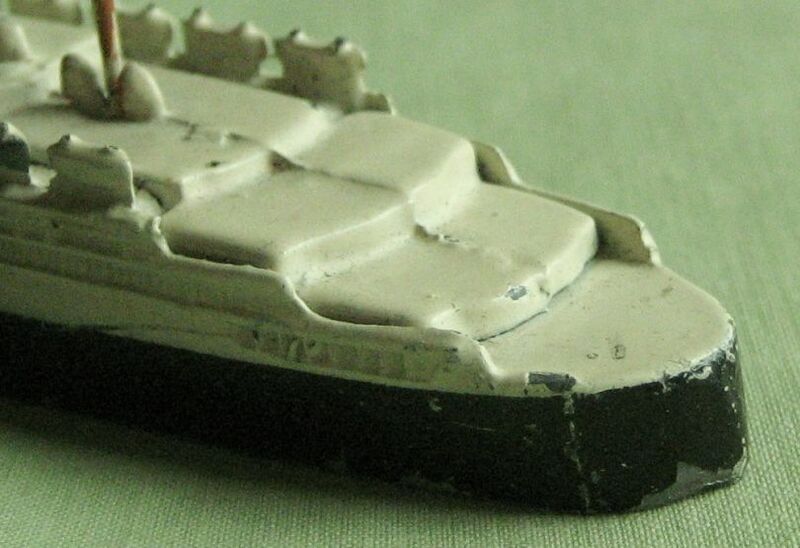 The only way to know is that others inspect their Queen Mary models and see if their findings are the same. Thanks for this new variety. As you know I have a small collection of Queen Mary models with boxes. I checked the seven I have and indeed found one with a smooth deck. Meccano made some different insides of the hull at the first models. No rollers, rollers on axles, rollers in tinplate frame. So I looked at the inside and found that my model is with rollers and the tinplate frame. Meccano had to change the die not only for the different text inside, but also to fill the holes in the hull after changing to a tinplate frame for the rollers. So my model has filled in axle holes, still visible, and a injection mark at the front. My conclusion is that there was a major change at the tools for the die. For those who want more information on the Queen Mary and the different boxes, see The Journal 2012 July with a article on this subject. Queen Mary was in production for a long time and many were made. So you can find different style labels on the box. Most common number 52 and 52A. Number 52B is not often found. You also find different labels at the small end of the box. These are only attached at one side. There are no date codes and production codes printed on these labels. So dating the boxes is not easy. No 52 Cunard White Star liner No 534 is the first. 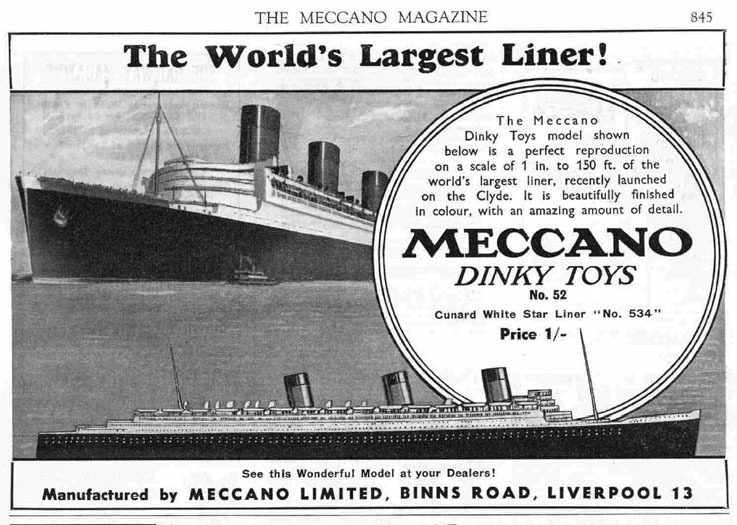 Label with just Meccano Dinky Toys No 52A Queen Mary is the French export box. This is my Queen Mary which has no rail around the stern. I do not have a box but the second photo shows the underneath.